We recently published the first part in this series about specialized construction marketing planning. It starts with a strategic marketing plan built for specialized construction with clear goals and measurable, results-oriented tactics can help you build up a lead-generating machine for your business. 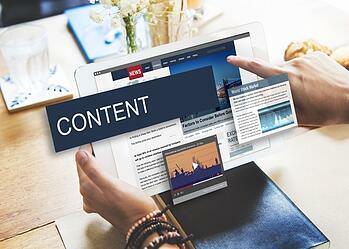 The second step is to create and distribute content that's relevant to your target audience. Relevant content will attract this audience to your website when they're searching for solutions, and will establish trust with them when they read what you've published. with the right information that they’re looking for. Whether you’re looking to partner with a general contractor or get hired for commercial work, maintaining relevance in the digital world is key to your future success because that’s where the researchers and buyers are. 69% of respondents to the 2016 B2B Buyers Survey from DemandGen said that the single most influential aspect of any vendor’s website is “relevant content that speaks directly to my company.” That same research revealed that Web search and vendor websites, at 68% and 54% respectively, were the first two resources that informed purchase decisions by B2B buyers. Your strategic marketing plan should clearly define what kinds of content to create, when to create it, and how to distribute it to be the most relevant to your ideal buyer. One example of highly relevant content to post includes blog posts. Companies who publish 16+ blog posts per month had almost 3.5X more traffic compared to companies who published between 0 - 4 monthly posts. The format of the content: What will you publish? Will it be a webpage, blog post, premium content, or something else? The persona you’re targeting with this content. Who will benefit from reading it? An idea of what specific topic you’ll be writing about: Under what umbrella topic does this content post fall that’s related to your business? The purpose of the content: What do you want people to walk away knowing? What stage of the buyer’s journey is this content in? Start by creating a strategy that clearly lays out your target audience and goals along with a defined, researched content plan to meet them. Then, write, publish, and distribute relevant content. Learn more here, and check out Part 3 - Attract and Retain a Defined Audience.